The 53.8 metre motor yacht Sea Force One has been sold to an Asian client with Paul Brackley at Central Yachts in Hong Kong acting for the buyer and seller. Built in Italy by Admiral Mariotti Yachts to a design by Luca Dini, Sea Force One was delivered in 2008 and is ABS classed. She went on to win a Judges' Special Commendation at the 2009 World Superyacht Awards as the Best Displacement Yacht of 50-59 metres. Accommodation is for 10 guests in five cabins including a master suite on the main deck with a folding sea balcony. Below deck, four double cabins each have a queen sized bed and all staterooms have full en suite facilities. The upper deck is reserved for partying. Thanks to the wonderful natural light flooding in, the black leather floors chime in perfectly and the whole area is designed like a disco with walls and ceilings in Barrisol fabrics and Formica. On the sun deck, there are numerous areas for sun bathing, as well as a spectacular Jacuzzi and a Teppanyaki grill. Surrounding the Jacuzzi is a lit DJ console, perfect for dancing beneath the stars. Twin 2,100hp Caterpillar engines give her a range of 5,000 nautical miles. 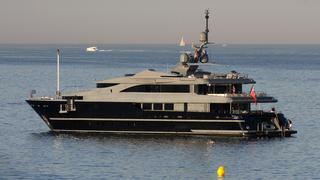 Sea Force One was asking €21.9 million.